Love That Max : Nice hat, Dad! I saw my dad on Sunday. He's 86 and a little out of it at times, but he's still plenty smart and generally not doing so bad. Especially considering the hat he was wearing. "Um, is that a pot plant on my dad's hat?" I asked the woman who helps take care of him. "Yes, it's ganja!" she said, cheerfully. She's from the islands, so she knows what she's talking about. Seems like she's been wheeling him everywhere in that cap. For a year now. "Who got it for him?" I asked. She told me she had a pair of pants to return to some discount-type store; the place wouldn't give her cash, so she decided to pick up a few things instead. Including this bargain $1.50 ganja hat. "Mom, what did you think that design was?" I asked. "I thought it was a maple leaf, like on the Canadian flag," she said. I pondered the hat. What the heck, I thought. 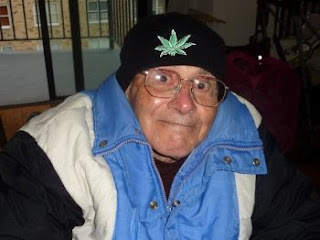 I mean, I don't want anyone mistaking my dear old dad for a weed dealer, I wouldn't let my mom buy ones for the kids and I'm not condoning ganja or anything, but there's something to be said about being the hippest 86-year-old in the whole hood. Go Maple Leafs! Ugh, should be leaves no? What are leafs? Oh, my God -- this makes me laugh so hard. I love it. Hahaha! That is toooo funny! I laughed so hard! I've got a pretty good one too, when I was in high school, I loved Bob Marley. My Mom went to the Philippines and picked up a bunch of random gifts for us at various flea markets, one being a huge flag with Bob Marley's face and about a dozen pot leaf's. My Dad is a narcotic's affairs agent. Way to go Mom! OK, I interrupt this silly post with some news for Natasha: No side effects to speak of from the swine flu shot. I mean, both kids have had runny noses, but they always get them this time of year. We now return to the regularly-scheduled ganja hat. What we don't know won't hurt us! For all you know, Mom and Pop could be regularly found down at the MJ clinic with their prescription from the "Don't Worry, Be Happy" doc, and they're not telling their babies because they don't wanna set a bad example! If you do start hearing Wailers music coming out of their hi-fi, and they break out the vintage lava lamp....then you'll know! Your dad is a handsome feller, BTW! He reminds me of mine! Ellen, thanks so much for the side - splitting laughter first thing in the morning! That picture is priceless! Oh man, that gave me a really good laugh this morning! And your dad looks so innocent too, which makes it even funnier. OMG that is sooooo funny!!!!! I need to get one for my dad!!!! I have had a pounding headache all day and it has made me a bit cranky. I cannot tell you how much I needed this laugh. Oh my word! Your mother is hysterical! A maple leaf? That is the funniest thing I have ever heard! There are tears running down my face--that is too funny. That's the funniest freaking thing I've seen all week. Can't wait for Hubby to get home so I can show him!! This might be my favorite post ever because it just made me laugh out loud! I'm reading this for the first time today because of your link in your dad's birthday post. THANK YOU. I needed this after the SNMom day I'm having. Hilarious.